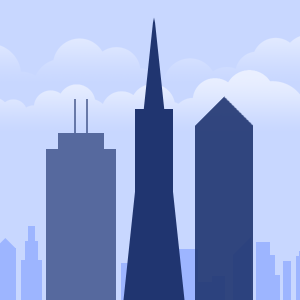 580 California Street is a high rise completed in 1987 in the Financial District of San Francisco, California. 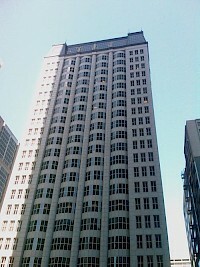 The postmodern, 107 m (351 ft), 23 storey tower is bordered by Kearny Street and California Street. There are twelve statues by Muriel Castanis on the 23rd floor, described as "The Corporate Goddesses". Albuquerque Plaza is a major mixed-use high-rise development on the south side of Civic Plaza in Downtown Albuquerque, New Mexico. It consists of two towers connected at ground level by a two-story promenade containing retail space. 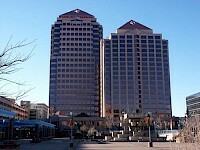 The taller of the two towers contains Class A office space, while the shorter one houses Hyatt Regency Albuquerque hotel. The office tower has 22 stories and rises to a height of 351 ft (107 m), making it the tallest building in New Mexico by a considerable margin. The Chant Tower is a thirty story mixed-use tower planned to be built at the SW corner of Jefferson & I-25 in Albuquerque. The Chant Tower is proposed to be taller than the 351-foot Albuquerque Plaza Office Tower. If built, it will become the second tallest building in the state of New Mexico after the The Residences at Packard Place slated for completion in 2010. This building will include a hotel, office space, and a limited amount of retail space. The Residences at Packard Place is a proposed two-tower, thirty-story, commercial-residential tower in Downtown Albuquerque. The Residences at Packard Place is slated to be taller than the 351-foot (107 m) Albuquerque Plaza Office Tower, therefore becoming the tallest building in the state of New Mexico. Packard Place will change the skyline of Downtown Albuquerque. This building consists of two towers, which will have 30,000 square feet (2,800 m) and 408 residences.